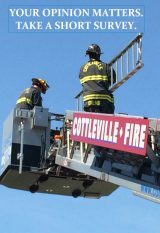 The Cottleville Fire District takes your safety very seriously! We have teamed up this year with the National Fire Protection Association to help promote your safety. Fire prevention week starts on, October 8-14, it serves to remind us all to review our own fire safety procedures. This year’s focus message reminds everyone that every second count, make sure to plan for two ways out of every room in case of a fire. For more information on this program and additional fire safety information, please visit, “www.nfpa.org/safety-information/fire-prevention-week”. Did you know that roughly half of home fire deaths result from fires reported between 11 p.m. and 7 a.m. when most people are asleep? Smoke alarms save lives. If there is a fire in your home, smoke spreads fast and you need smoke alarms to give you time to get out. In fact, having a working smoke alarm cuts the chances of dying in a reported fire in half! Keep your family safe with a working smoke alarm in every bedroom.